We analyzed data for 333 HIV antibody-positive (HIV+) and -negative (HIV-) hemophilic children/adolescents, to examine whether the relationships among immunologic parameters and vaccine-related serology supported a shift with advancing HIV infection. In stepwise logistic regression analysis of HIV+ children’s data, anergy to a panel of delayed hypersensitivity skin test antigens was positively associated with serum immunoglobulin A (IgA) levels (p = 0.012) and CD8+ cell counts (p = 0.021) and negatively associated with CD4+ cell counts (p = 0.002). Modeling supported anergy as a positive correlate of log IgA level (p = 0.046) and CD4+ lymphocyte count as a negative correlate, for HIV+ participants only (p < 0.0001). For mumps, the proportion of vaccinated HIV+ participants with protective IgG antibody titers was higher among those with CD4+ lymphocyte counts < 200 cells/mm3 (p = 0.058). For HIV+ participants < 14 years of age, this same trend was seen for measles and rubella, but was not seen in any age group for bacterial vaccine antigens. 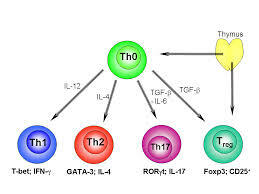 The intercorrelations among skin test anergy, CD4+ lymphocyte counts, serum IgA levels, and viral vaccine antigen-related serologic titers for HIV+ participants are consistent with an association between progressive HIV-related immune dysfunction and a predominance of type II (humoral immunity) or Type 0 (mixed immunity), relative to type I, lymphocyte profiles.